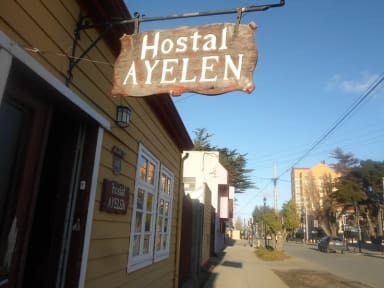 Hostal Ayelen v Punta Arenas, Chile: Zarezervujte nyní! Hostal Ayelen is built in a characteristic house of principles of the 20th century, with a very large land, high ceilings and large rooms, which with the pass of time was enlarged with more new constructions. we have an area of private rooms, with kitchen, living room and dining room, and separated by a luminous corridor, another area of rooms shared with your own kitchen living room. the property has a patio in the middle which is used to make barbecue and another patio of parking. In addition, we have laundry. 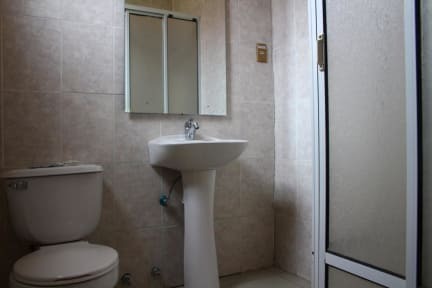 Hostal Ayelen is located in the most central place of the city, with a strategic location for the traveler, four streets away from the strait of Magallanes, less than 100 meters from the bus companies and three streets from the main square as well as to one street of the supermarket and three streets of the gastronomic and night district. Furthermore, our facilities are located to a few blocks from the mirador (belvedere), the cemetery and the most important museums of the city. We have two shared rooms with 2 bunk beds (for 4 people) each one and private bathroom as well as one bedroom with 3 bunk beds (for 6 people) with bathroom outside the room. In addition, we have several common areas where the guests can get together and exchange past experiences and future plans. For the private rooms, the rate includes the breakfast. For the dorms, the rate does not include the breakfast. The price of the breakfast is 3.000 CLP (Pesos Chilenos) by person. If possible, we can accommodate the guests before the check in time if there is availability before such time.